Savoy Theatre is located at Savoy Court, The Stand, London, WC2R 0ET! Positioned on the strand, the magnificent theatre is at one of the busiest areas for shopping and various other entertainment activities. The area is also home to some other popular theatres such as Vaudeville and Adelphi. Some of the famous nearby tourist attractions are Covent Garden, Leicester Square and the River Thames. The hugely desirable and popular Savoy Hotel is also located at a nearby distance. On the top of th Savoy Theatre, there is a well equipped health club and swimming pool. Theatre is located at an accessible location and can be easily commuted via various modes of transportation such as tubes, cars, taxis an buses. You can visit the theatre by bus numbers 1, 4, 6, 9, 11, 13, 15, 23, 26, 59, 68, 76, 77a, 91, 168, 171, 172, 176, 188, 243, 341, 521 and RV1. With the reasonable huge occupancy of 1158, the magnificent theatre has been categorized into three levels as Stalls, Dress Circle and Upper Circle. For those who are looking for best viewng seats then it would be advisable to opt for front row seats of the Stalls or Dress Circle. For the disabled patrons and carers, discounted seats are available. People having hearing problems could be provided with portable box radio system. In the year 1881, Savoy Theatre made its grand debut and started some of the original comic operas of Gilbert and Sullivan. 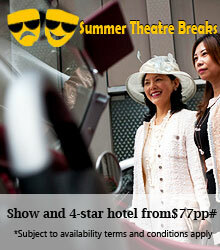 Theatre has been always synonymous with the hosting of quality dramas. C J Phipps designed the theatre in a very innovative way with the usage of electric lamps above gaslight. Late, it became the first building which was completely lit by electricity.